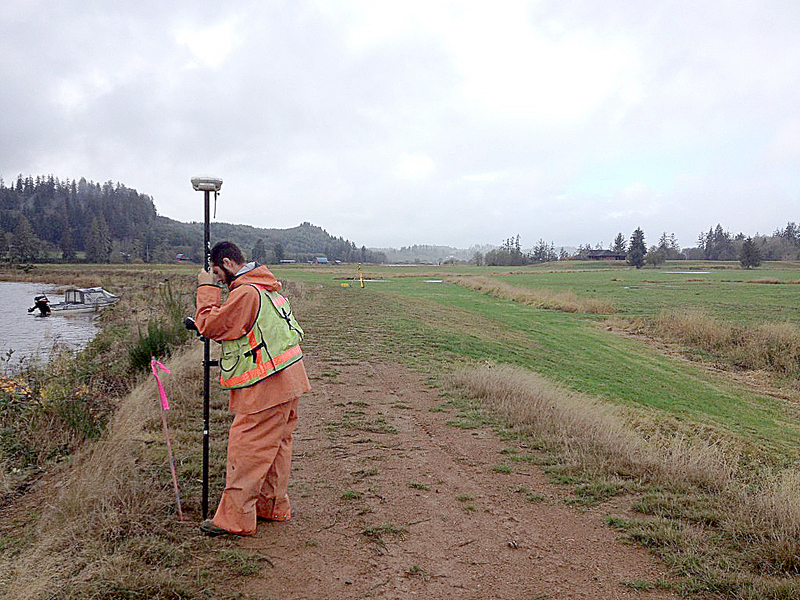 SWLS was contracted to provide Columbia River Estuary Study Taskforce (CREST) with a combined hydrographic and topographic survey of a section of the Klaskanine River near Astoria. The objective of the project was to restore 50+ acres of emergent and forested estuarine wetland through breaching and lowering of levees, and restoration of tidal channels. The project involved the creation of a cross levee to protect adjacent property from flooding. This was a very technical project. For the hydrographic portion of the survey, Statewide used a 16’ jet boat and a Trimble RTK GPS. The Hydrolite echo sounder sonar unit was also used, streaming depth values into a TSC3 data collector using a set time interval. The depths were then subtracted from the RTK X, Y, and Z position of the transducer. A cast of the water column was made two times a day with the Digibar Pro, collecting a sound velocity of the water column every five feet in depth. The average reading of the cast was then used for the sound velocity setting in the Hydrolite sonar unit.